Working with EuroRSCG 4D, Alembic undertook the user interface development to convert PSD design flats into a functional, cross-browser compliant CSS/XHTML prototype, seamlessly integrating with the digital agency's development workflow. Digital agency EuroRSCG 4D needed user interface development services to bridge a resource gap between design and application development capabilities for a project developed for Bell Mobility. Alembic worked closely with agency project managers, designers, and programmers to generate semantically structured, lightweight, cross-browser compliant XHTML/CSS templates suitable for application programming integration. 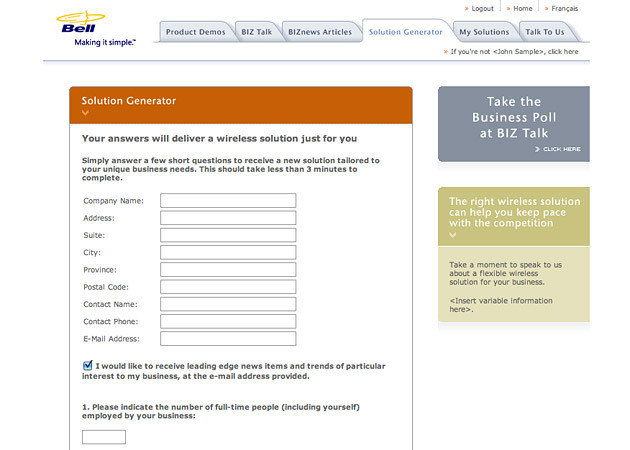 The core feature - a solution generator designed to automate the small business, wireless service recommendation process - computed a variety of factors and business variables and output a customized solution. 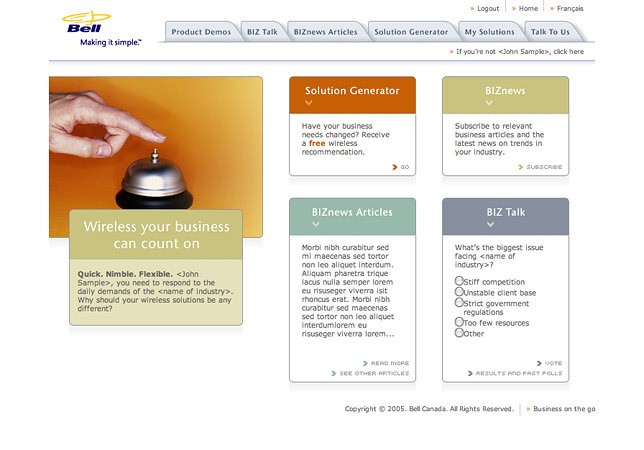 Complementary database-driven features and functionality included a small business polls and news articles, and product demos. 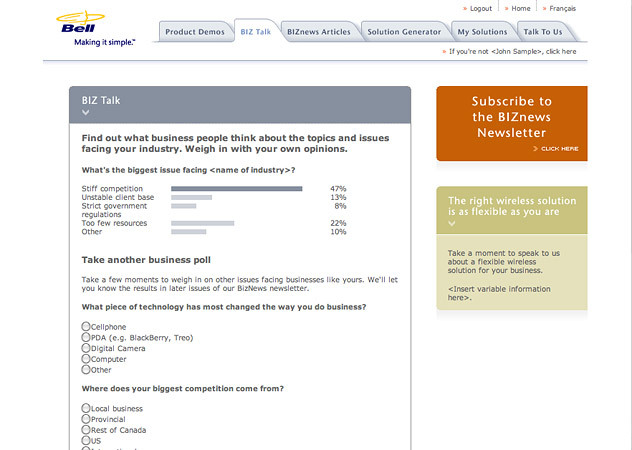 In order to accommodate variable content requirements, such as quantity of text, number of poll question options, and poll responses, all box model objects had to be coded to expand and contract as needed. At the same time, all background and CSS presentation code had to be linked to semantic HTML elements in order to keep page weight and loading time down, and for ease of maintenance. 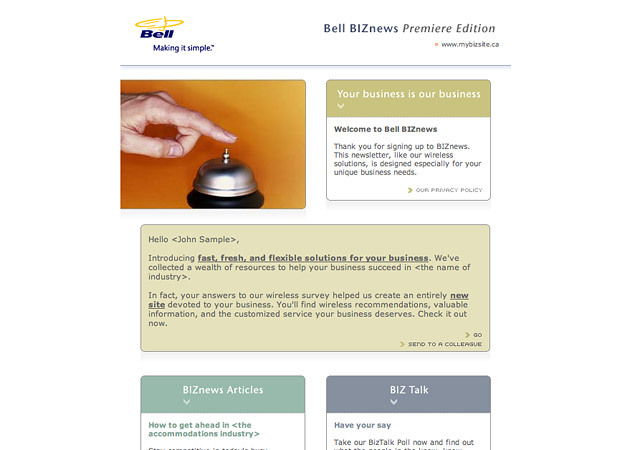 Dynamic BIZ Talk content was also syndicated for customized, personalized email newsletter delivery. For unified branding and consistent look and feel, website interfaces were effectively and successfully leveraged for HTML email despite highly inconsistent rendering of CSS and HTML in email clients at the time.